Our Magnum Cookie Sheet is OUT OF STOCK, but we have ordered more! You are still able to purchase it now and we will ship it to you as soon as it arrives. Questions? Please call 1-800-438-5346 or email us at info@Lehmans.com. More cookies in less time. What's not to love about that? When it comes to sheer volume, it's hard to beat our heavy-duty, giant-sized cookie sheet - our product testers baked 3 dozen cookies at once. Note: This pan is much larger than standard cookware; check your oven dimensions carefully before ordering. 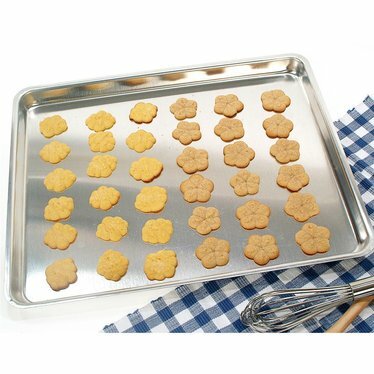 With this wonderful cookie sheet, your holiday baking will be done in no time! Very sturdy & well made! Only thing I can think of that would be better than this....is having TWO! !